Primary hemorrhagic stroke is a known but uncommon complication of sickle cell disease (SCD) in childhood, but extradural hemorrhage (EDH) is a more rare complication. EDH mostly develops after head injury with dramatic neurological deterioration. Among various presentations of complications (Primary hemorrhagic stroke mostly subarachnoid or intraventricular) of SCD, EDHs are rare clinical entities that may occur in children. We present a rare case of spontaneous bilateral EDH with SCD who presented with mild on and off headache in a 13-year-old boy and review the possible suggested mechanisms of its occurrences. A 13-year-old boy presented with on and off headache for 2 years with vomiting and severe headache for 2 days without any history of trauma. He was a known SCD patient and was initially managed conservatively. 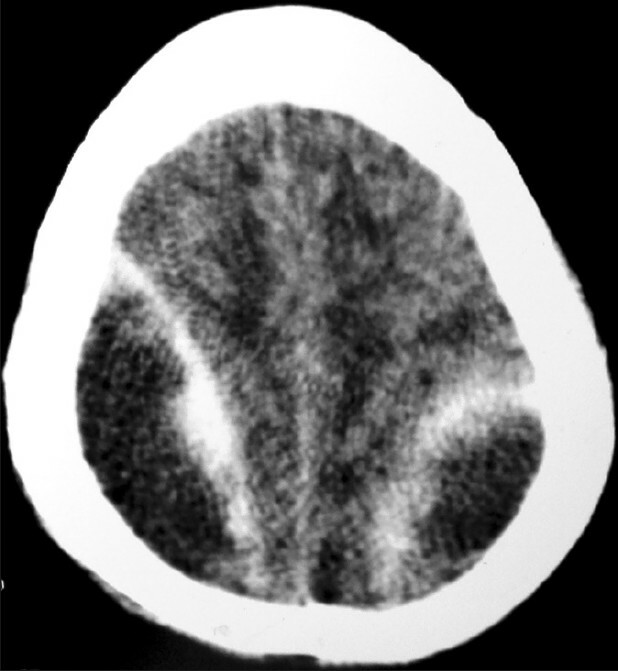 CT scan revealed bilateral EDH in posterior parietal area [Figure 1]. 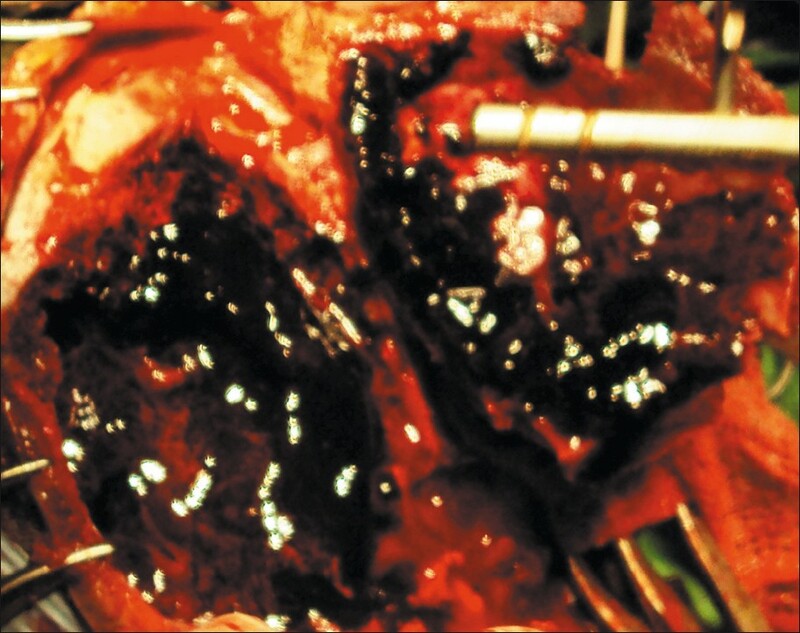 Bilateral osteoplastic craniotomy and evacuation of hematoma [Figure 2] were done under general anesthesia. Postoperative course was uneventful. 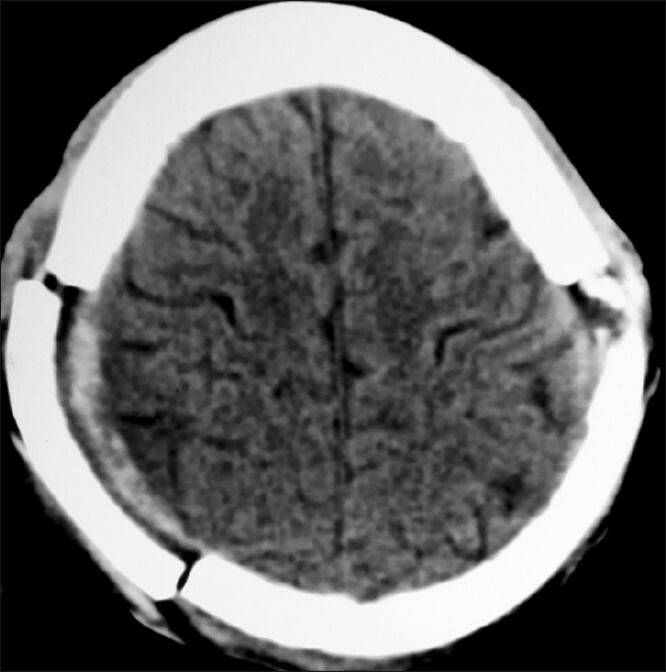 Postoperative CT scan revealed total removal of hematoma with satisfactory re-expansion of brain [Figure 3]. In summary, this is an unusual case of EDH (nontraumatic) in a child with SCD, from a sickle cell belt of Orissa. The child survived after extensive supportive care and then evacuation of bilateral EDH after osteoplastic craniotomy and was making progress in rehabilitation 3 months later. Reports of similar cases may provide new insights on the etiologies of EDH in SCD. EDH is among the emerging challenges in SCD care, because screening and preventive transfusions are reducing ischemic stroke, and therefore, more attention should be directed toward the nuance of hemorrhagic catastrophe. 1. Hene-Frempong K, Weiner SJ, Sleeper LA, Miller ST, Embury S, Moohr JW, et al. Cerebrovascular accidents in sickle cell disease: Rates and risk factors. Blood 1998;91:288-94. 2. Tsomi K, Karagiorga-Lagana M, Karabatsos F, Fragodimitri C, van Vliet-Konstantinidou C, Premetis E, et al. Arterial elastorrhexis in beta-thalassaemia intermedia, sickle cell thalassaemia and hereditary spherocytosis. Eur J Haematol 2001;67:135-41. 3. Browne GJ, Lam LT. Isolated extradural hematoma in children presenting to an emergency department in Australia. Pediatr Emerg Care 2002;18:86-90. 4. Fullerton HJ, Wu YW, Zhao S, Johnston SC. Risk of stroke in children: Ethnic and gender disparities. Neurology 2003;61:189-94. 5. Malik NK, Makhdoomi R, Indira B, Shankar S, Sastry K. Posterior fossa extradural hematoma: Our experience and review of the literature. Surg Neurol 2007;68:155-8. 6. Stockman JA, Nigro MA, Mishkin MM, Oski FA. Occlusion of large Cerebral vessels in sickle cell anemia. N Engl J Med 1972;287:846-9. 7. Royal JE, Sealer RA. Hypertension, Convulsions and cerebral hemorrhage in sickle cell anemia patients after blood transfusions. Lancet 1978;2:1207. 8. Powars D, Adams RJ, Nicholas FT, Milner P, Charache S, Sarnaik S. Delayed Intracranial hemorrhage following cerebral infarction in sickle cell anemia. J Assoc Acad Phys 1990;1:79-82. 9. Cabon I, Hladky JP, Lambillotte A, Cotton A, Dhellemmes P. Uncommon etiology of extradural hematoma. Neurochirurgie 1997;43:173-6. 10. Dobson SR, Holder KR, Niettert PJ, Laver JH, Disco D, Abboud MR. Moyamoya syndrome in Childhood sickle cell disease: Predictive factors for recurrent Cerebrovascular events. Blood 2002;99:3144-50. 11. Keyrouz SG, Diringer MN. Clinical review: Prevention and therapy of vasospasm in subarachnoid hemorrhage. Crit Care 2007;11:220.